A clever remix of a brilliant 1979 prog opus that conjures ancient evils like Lovecraft. “Gothic Chamber Music” is a common signifier for the brand of music the Belgian prog group Univers Zero perform, but it’s a misnomer that undersells the effect of their symphonic unnaturalness. Though Univers Zero had gained some notoriety from their participation in Henry Cow’s Rock-In-Opposition (RIO) community in their early days, the group largely became known stateside after the modern semantic usage of “gothic” was appropriated by the movement that developed parallel to Univers Zero’s own history. Goth music (as opposed to, say, gothic literature) was a music of pomposity and masquerade. It held with the Laveyan Satanist gesture that the notion of quote-unquote "evil" could be used as a stand-in for an abiding opposition to the conservatism of cultural norms. Moreover, goth music held that performative evil, in a culture reliant on random signifiers, could be presented as a carnivalesque perversion of Western values, a gaudy overinflation of society’s inherent artificiality wherein the body’s natural drives, particularly the hedonic Eros and Thanatos (and combinations thereof; see goth’s assumption of fashion cues from the sadomasochist community), could roam freely about in the larger culture sans the standard Freudian repression techniques. Univers Zero, on the other hand, were more than happy to keep the veils to any repressed darkness cloaked. Their original name, Necronomicon, suggests a shared interest with Lovecraft in an evil that is clandestine, inhuman, and unknowable. For Univers Zero or Lovecraft, uninhibited carnality in fancy dress clothes seems like an all-too-human series of vices. In fact, this kind of activity seems a bit like the habitual undertakings of the rock stars RIO was “In-Opposition” to. The dark forces behind an album like Heresie exist regardless of frigid moral codes, and linger so far beneath the surface that they need to be conjured and incanted in order to even be heard by fallible human ears (and Heresie album opener “La Faulx” sounds precisely like this kind of incantation). Univers Zero’s music, both performing and listening to it, is labor -- a conscious, concentrated, and exhausting effort full of unresolved tension, illusory endings, and alchemical combinations. It’s ritual magick, seemingly in service of mystical elements that defy communication (it’s largely instrumental music except for the invented language used for the chanting throughout “La Faulx”) or easy comprehension (the odd time signatures, the complex structure, the long periods of atonality, et. al). On the surface, the group themselves appeared to be some kind of unholy hybrid of a rock band and classical (or, sure, chamber music) outfit. Instrumentally, they featured percussion, guitar, oboe, violin, bass, viola, piano, bassoon, and harmonium, but there’s little on Heresie or their self-titled debut before it (also known as 1313) that bears any sense of rock tradition. Far from dragging mongrel rock music screaming into the conservatory, or denigrating bourgeoisie intellectual music by simplifying it for the proles, Univers Zero played their own game with all the methodical precision of five guys who wanted their music to be perceived as if it were from some ahistorical hidden dimension (the band would often joke that they played “funeral marches”, but one listen confirms that the music is far too jarring and angular for any processional). 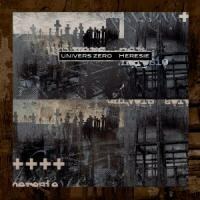 Reducing their numbers since 1313, Heresie found Univers Zero becoming even tighter as a unit -- impressive, since they were already pretty strict in their aesthetic. Percussionist Daniel Denis and multi-instrumentalist Roger Trigaux are widely recognized as the bandleaders during this period, but Trigaux left soon after to form the more guitar-oriented though similar Présent. With Denis at the head of the group since then (the band is still together), it’s unsurprising that this remix mainly focuses on amping up the drums. Luckily, though, percussive compression does not come at the expense of the album’s dynamic range, as is the case with so many label-initiated reissues these days. Violent histrionics and panoramic timbres are the group’s bread and butter and, to these ears, the intensive new finish by Didier De Roos may even improve upon the original mix. Univers Zero’s music is so carefully choreographed that it often seems like it’s Mickey-Moused to an invisible series of movements, like Carl Stalling for devil-worshippers. “Jack the Ripper” is an operatic take on the aforementioned monster, Denis’s rhythm section traipsing and stalking around in the dark as atonal shrieks by violinist Patrick Hanappier soundtrack a kind of surgical mutilation. Whereas prog delights in tilting the axis just when the listener starts getting comfortable, Univers Zero seem to be drawn to narratives that are themselves a bit askew and thus require an appropriate accompaniment. The other major change in the latest mix is the addition of modern plugins and effects, unavailable to a budgeted orchestral unit in 1979, to certain parts of the recordings. While some many decry any alteration of this kind as (forgive me) heresy, the changes are, for the most part, seamless. Their greatest impact is felt on those demonic voices that arise midway through “La Foulx”. De Roos also appears to have spaced out the multitrack layers, giving a whole new sense of ambiance to the album. As per Cuneiform’s previous reissue, a bonus cut, the studio version of “Chaos Hermétique”, a staple of the Présent repertoire, has been included. It’s a vital addition, notable particularly for anticipating Lynch/Badalamenti at the 9 minute mark as a somber brass solo is followed by unsettling shrieks and squeals. Heresie may not be an easy listen, but it’s Univers Zero at their peak, the best representation of who the group are and what they are capable of. This terrific remix job by De Roos for Cuneiform is essential for both completists and newcomers alike.